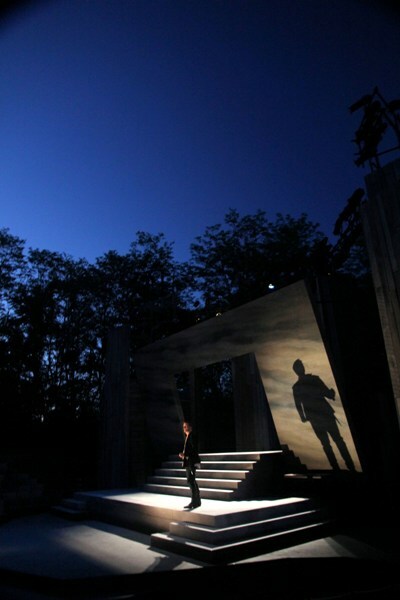 SPRING GREEN, WI — As summer turns into fall, it’s worth making time to catch Chicago actor Matthew Schwader as that restlessly inquisitive and acid wit, Hamlet, who comes magisterially unhinged in Shakespeare’s masterwork. 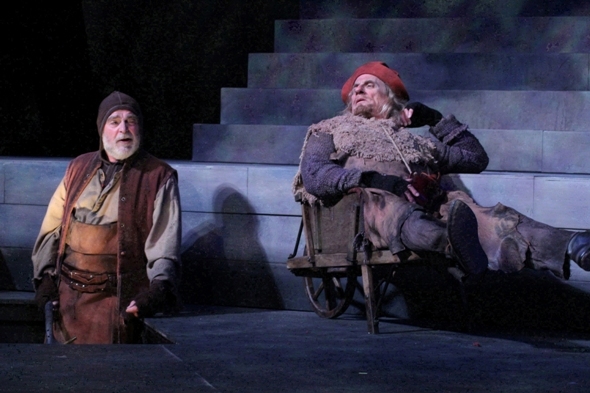 “Hamlet” is enjoying a gloriously long reign at American Players Theatre in Spring Green, WI. The tragedy unfolds on an open-air stage at the top of a hill in the rolling landscape southwest of the Wisconsin Dells. APT is jewel of classical tradition that has drawn theater lovers from Illinois for more than three decades. 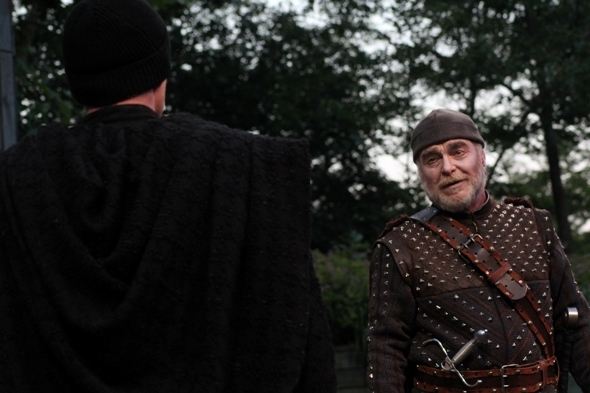 Director John Langs has made shrewd choices that put us inside Hamlet’s head and keep us there. This furious youth is convinced that his uncle has murdered his father, usurped the kingdom and married his mother in one sickening swoop. Now he looks for proof of foul play in the shadows, agonizes over how, and whether, to take action, and ultimately spirals into the abyss. The show begins well before a single line is uttered on spare chameleon sets of Takeshi Kata and Andrew Boyce, whose innocent angles can turn Caligari-like with a flick of Michael A. Peterson‘s lighting magic. Royal guards are already on duty, staring out in all directions, tense, weapons at ready, when audience members descend into the intimate arena and darkness falls. Something has clearly alarmed these elite tough guys, who would be unfazed by ordinary threats. Their first lines get to the crux of the collective unease — they’re loath to admit they’re being visited by something no one wants to believe, and for which no one has been trained. The scene is often cut because a similar watch scene, this time with young Prince Hamlet in attendance, shortly follows. 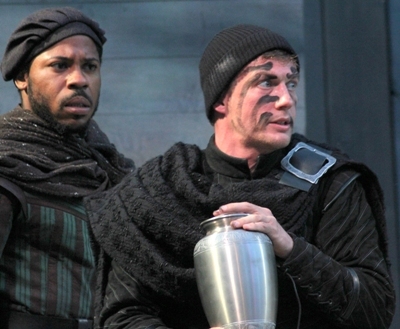 But without the first one, when the soldiers and Hamlet’s friend Horatio (Ro Boddie) see an apparition of the dead king in spite of themselves, one is too inclined to focus immediately on Hamlet’s craziness as his alone, thus giving short shrift to the apparent evidence at hand, and to the general anxiety reverberating in the realm. Schwader’s Hamlet arrives at the watch site garbed and greased like a guerrilla fighter, clutching the urn with his father’s regal ashes. One can assume everyone standing guard is thinking Freakin’ Ay! to that. Langs’s directorial conception sharpens the insult to Hamlet that his mother, Gertrude, has remarried too quickly. Deborah Staples plays her as a ravishing beauty who appears not yet out of her thirties. Hamlet’s own age is a bit ambiguous, but there’s a suggestion in an early scene that he’s about 20, so her age and beauty are quite plausible, and Staples boldly pursues the opportunity it implies: She positively glows with desire in these early scenes, appearing giddy with bliss from the marriage bed and oblivious to the general embarrassment her fondles cause at court. Meanwhile the new King Claudius (Jim DeVita, shiveringly cold and ruthless) seems already distracted, eager to focus on the consolidation of his sudden power. In Langs’s conception, Hamlet sees his father’s face and form nearly everywhere he turns, and so do we. James Pickering plays not only the ghost of Old King Hamlet, but also, as Shakespeare himself probably did, the Player King whom Hamlet instructs to perform a thinly veiled recap of the murder — to trap his uncle Claudius unaware in a look that gives away his guilt. 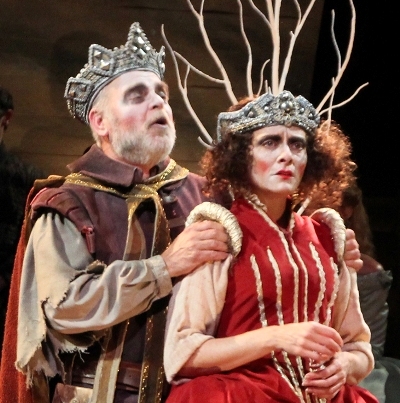 (The Player King and Queen have such a smashingly grotesque resemblance to Claudius and Gertrude that one can’t help admiring Hamlet’s little joke.) Finally, the wrung-out prince sees his father’s visage once again in the wry gravedigger with whom he trades killer zingers about the existential end of all things. 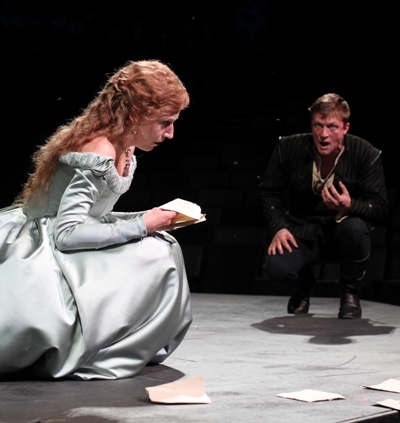 In Hamlet’s vengeful crusade he commits horrible acts of his own, none worse than the annihilation, by degrees, of his young love Ophelia (the heartbreaking Christina Panfilio), first by rejecting her and then by accidentally killing her gentle bear of a father, Polonius (the charming David Daniel). Hamlet says he regrets the error, but by then he’s really beyond caring. He sees in Ophelia only another whoring version of his mother. It’s left to the traumatized ingenue to measure the catastrophic effect of Hamlet’s rampage, and Panfilio’s mad scene has Ophelia dropping rocks instead of bestowing flowers, crazed but undeniably accusing, in a harrowing counterpart to Gertrude’s collapse. Throughout this remarkable production, the Schwader’s charismatic Hamlet holds his audience close, sometimes venturing even into the aisles so that Hamlet’s high-energy monologues seem like conversations that accidentally veer in unexpected directions, revealing more than he realizes, even to himself. It is a real gift to experience Shakespeare’s greatest play without the generalized expression that substitutes for absolutely clear and specific meaning. “Hamlet” is great poetry, but it’s not poetry that Schwader talks at us. Rather he speaks Shakespeare’s language as freely and with as much specificity of intent as he speaks his own. Shakespeare’s longest play, lasting three and a half hours in APT’s generous version, thus goes by quickly. But Shakespeare’s plays are these days cut so often, and by so much, that one mistakenly assumes it’s generally necessary. And although there is no such thing as a production of “Hamlet” that one can’t learn from — including those that substitute pageantry and spectacle for entire scenes, those that reorganize or streamline the story line, and those that transfer the play to opera stage or silver screen — the simple truth is that nothing can beat the straightforward delivery of Shakespeare by so carefully coached ensemble as APT’s. Vague phrases snap into focus. Archaic distance dissolves. The tragedy becomes urgent.